Review: Set in rural England, 1865. Katherine bought to be the bride of an older man. While he is away she seeks solace in the arms of a servant. 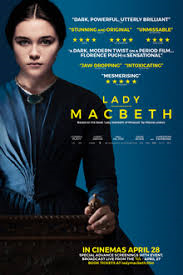 This is an adaption of an 1865 Russian novella Lady Macbeth of the Mtsensk Districk, which you could say has echoes of Jane Austin. One thing I have to say about this is that there isn’t much in the way of dialogue although the script is very well written. It is a very hard watch. Very grim at times but on the plus side there is much to like about it such as the scenery (the rugged landscape). While watching this you can actually smell the atmosphere. Ari Wegner has done a terrific job of capturing the cinematography. I have not seen any of William Oldroyd’s films before but would love to see him direct other features like this. Fantastic performance by Florence Pugh who was also the main actress in The Falling, 2014. She carries this film all the way through. There are only three musical feature film scores in this. You pretty much know what you are going to expect with the title being called what it is and also the movie poster. Even though this is very dark I did actually find myself laughing out loud quite a few times.